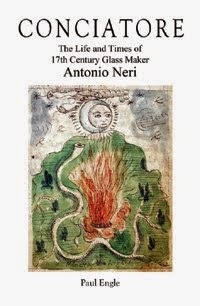 This is the third and final part of an examination of the godparents of seventeenth century glassmaker Antonio Neri and his brothers and sisters. In early modern Florence, the families of godparents formed tight alliances, helping each other with business opportunities and social contacts. The Neri family was no exception; their godparents formed a very well connected group. Margherita Ardinghelli appeared as godmother to Antonio's brother Jacopo Neri. Eight years later, her husband Braccio's first cousin, Monsignor Giovanni Alberti, appeared as younger sister Maria Neri’s godfather. 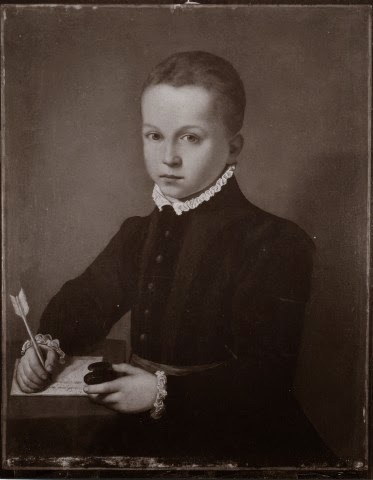 Giovanni was also the son of a Florentine senator. He served as protonotary apostolic for Pope Gregory XIII and as bishop of Cortona under Pope Clement VIII. A godfather serving in the papal inner chambers was a good family contact indeed. Also appearing for Maria was Pierfilippo Perini, a physician. Other records indicate Perini was also a lawyer, apparently part of the Ricci household. The Registri lists Maria Neri's godmother as Alessandra di Girolamo Pepi. Among the prominent Florentine republicans was Alessandra's father, Girolamo. He was tortured by Alessandro de' Medici in the 1530s, upon the family's regaining control of Florence after the siege. Emilio's two godfathers were Alessandro Gondi (pictured) and Gondi's own father, Giovanbatista. At the time, they were 20 and 66 years-old respectively. The Gondi's ancient Florentine roots trace back to the rule of Charlemagne, who first established the heraldic nobility system in Florence in the year 800. The Gondi's were bankers and landholders in the Mugello region between Florence and Bologna, where the Medici family originated. A branch of the Gondi family became heavily involved in the French court under Catherine de' Medici. Giovanbatista had appeared two decades earlier, in 1564, as godfather for Bianca Cappello's first child Pellegrina. Bianca was the controversial Venetian lover of Grand Duke Francesco de' Medici who later became his wife and Grand Duchess. Giovanbatista's brother Piero was friends with Michelangelo. The artist once gave him the keys to the New Sacristy in the San Lorenzo Basilica in order to hide family belongings during the sack of Rome. In Antonio Neri's time, members of the Gondi family were intermarried with the Ardinghelli and Ricci families. They all supplied godparents to Antonio's siblings, the children of Neri Neri and Dianora. In addition to standing for Emilio Neri, Alessandro Gondi appears again four years later in 1587 as a godparent for Alessandro Neri, the eventual heir to the Neri family's fortunes. Lucrezia, the youngest Neri girl, has a single godparent listed in the register, Montiglio degli Albizi. The Albizi family boasted powerful bankers and politicians. This was another case where deep divisions over Medici rule drove a family apart and eventually into near extinction. Luca degli Albizi headed the pro-Medici faction in Florence in the latter half of the sixteenth century. This branch of the family thrived, living in a series of palazzi just a few steps to the west of the Neri's parish church, San Pier Maggiore, close to the Neri home. They resided alongside properties owned by the Altoviti and Valori families. Today, perhaps the best-recognized member of the Albizzi family was Eleonora degli Albizi the young consort of Cosimo I after the death of his first wife, also named Eleonora. Folklore has it that in 1566, Cosimo intended to retire from public life and marry Albizi quietly, after the birth of a girl, but his regent son, Francesco I, forbade it to due to the inheritance complications that would ensue. The story is that Cosimo's long-time personal secretary, Sforza Almeni, leaked word of the clandestine marriage to the family. For his betrayal, an enraged Cosimo murdered Almeni in cold blood. Eleonora later gave birth to Don Giovanni de’ Medici, the uncle and friend of Don Antonio, Neri's sponsor. The specific Albizi family member we are interested in, Lucrezia's godfather, Montiglio degli Albizi, seems to have eluded history, although the first name ‘Montiglio’ is almost certainly a moniker for an immigrant to Florence from Italy's Piedmont region. Like his older brother Francesco, Alessandro Neri boasted a godfather from a powerful banking family, this time the Ricci clan. Godfather Federico de' Ricci, was a very famous name indeed. Federico was named for his father's first cousin, who ran the influential Federigo de' Ricci and Partners public bank and helped to finance Cosimo I in the war for Siena. Together, the Ricci and Acciaiuoli families controlled the Tuscan treasury for the Medici. (Giovanni Acciaiuoli was Francesco Neri's godfather). Alessandro Neri's godfather was closely related to the venerated holy-woman Catherine de' Ricci later canonized as Saint Catherine. His second godfather, Alessandro Ginori, was a Benedictine monk at the Badia Fiorentina, taking the name of Don Gregorio. He descended from a long line of Florentine merchants, bankers and republican leaders. Four years after the baptism in 1591, the monastery elected Ginori as their abbot. Distinguished for great learning, his peers considered him one of the leading writers of his day. Five years later, he moved to the abbey of San Paolo d'Aragon in the territory of Bergamo, where he died in 1598. The same year saw the death of Neri Neri, Antonio's father.